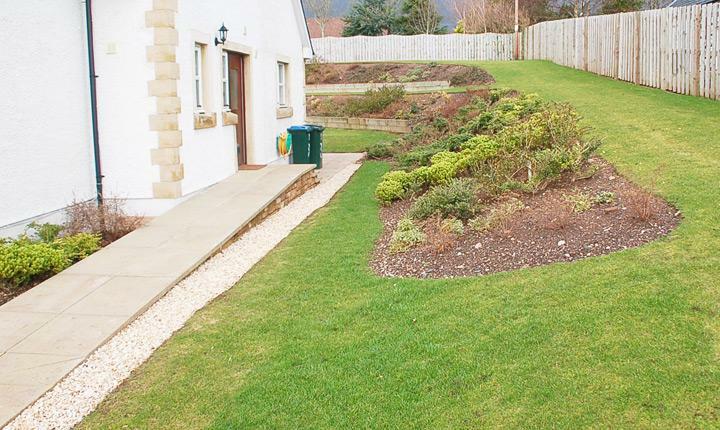 This project took us to New Fowlis, just outside Crieff where we undertook a two phase garden landscaping project. 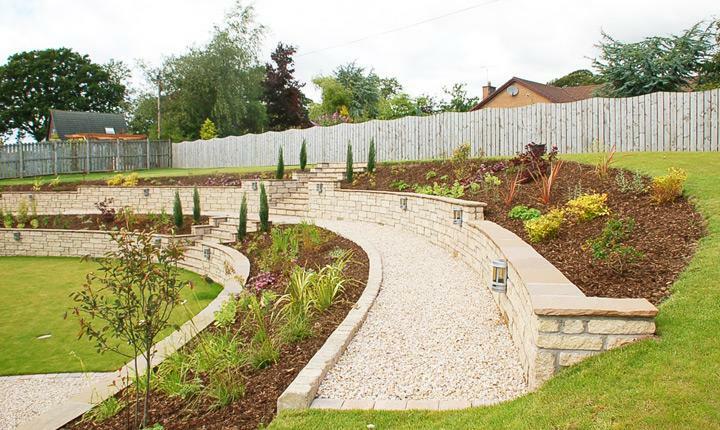 Phase 1 included an extensive terracing project to the rear of the property. Phase 2 involved constructing boundary walls to the front of the property with stunning cast iron gates adding the finishing touches to the entrance to the property. Our client invited us to re design the rear garden and create an extensive walled terrace spanning across the garden with a grand stairway in the centre. 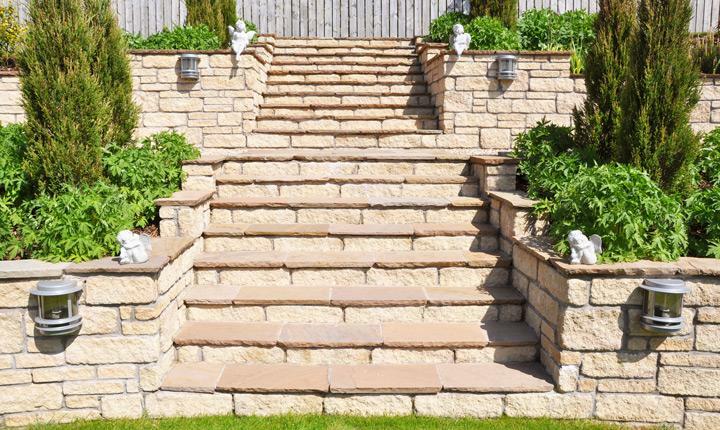 The existing wooden sleepers and steps were removed and walls were constructed using anstone old weathered cottage stone with a sandstone cope to finish. Walkways were created along each terrace, edged with tegula kerbs and the paths were infilled with Douglas Muir quartz gravel. All the remaining areas were prepared for turf and new lawn areas were formed. 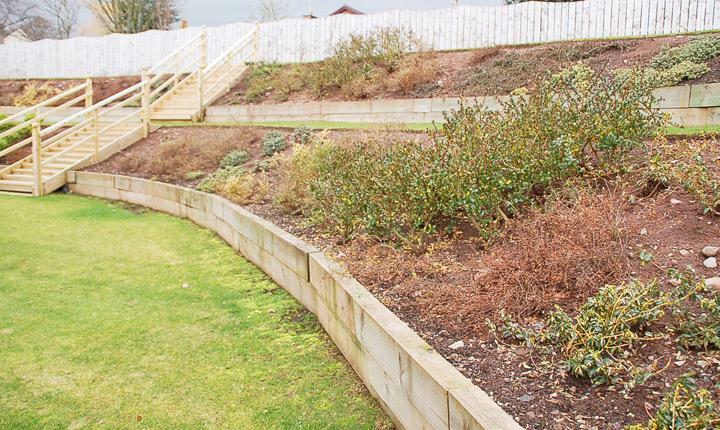 To complete the project the terraced borders were laid with bark and we designed and planted an attractive mix of shrubs and plants – the project was a magnificent make over. 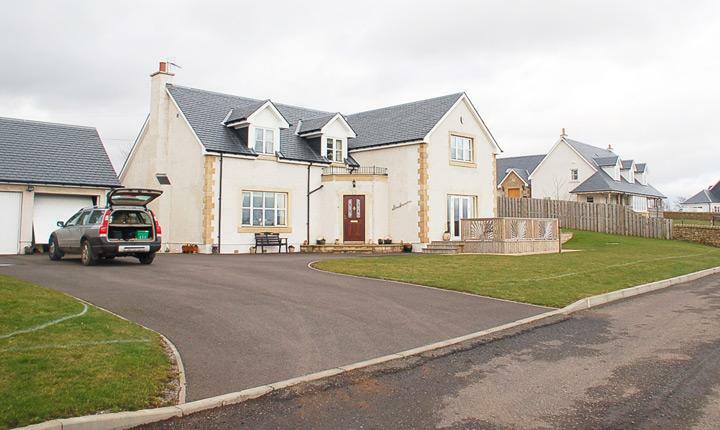 We were tasked with designing and creating an impressive frontage to this charming property. The design was put together and we constructed walls and gate pillars using anstone old weathered cottage stone, in keeping with the house and also the terracing project at the rear of the property. Our blacksmith designed and incorporated railings to the wall and electric gates to complete the design. Both projects saw real transformations to the garden. 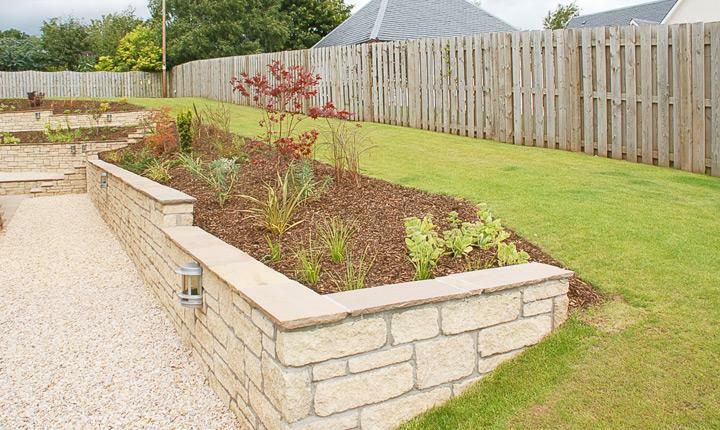 The rear garden walling project provided level terraced areas with easy access to each border area. Planting provided interest adding softness to the borders with colours and textures. 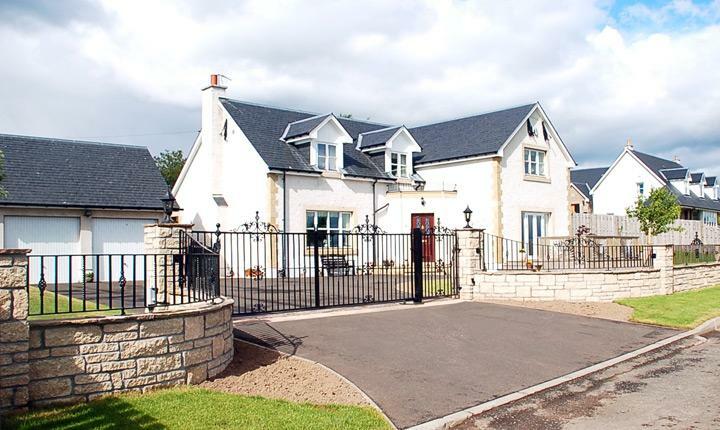 The front walling project created a grand frontage to the property and inkeeping with the look and style of their beautiful home. 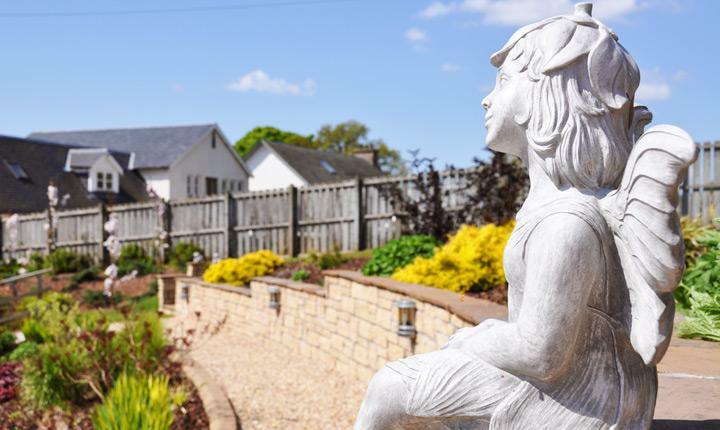 "Our garden gets compliments 'galore' from friends and family and is a pleasure to work in rather than the nightmare chore which it was initially. 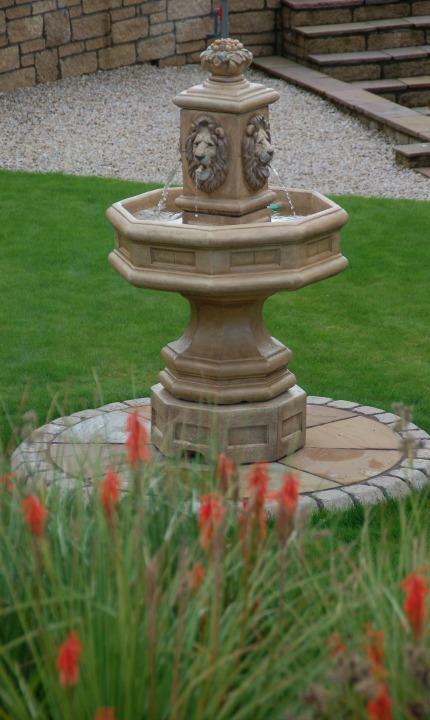 All in all we are very happy with all of the work done and would recommend Gardens Galore very highly to prospective clients."